Let’s begin with the author himself, the Mad Arab. Any Arabic speaker can tell you right off that “Abdul Alhazred,” while sounding very Arabic, is not a proper Arabic name. It is gibberish and nothing more. Lovecraft invented the name when he was five years old after reading 1001 Arabian Nights. He admits to this in a letter to Harry O. Fischer written in late February 1937. It has been speculated that the name was corrupted and could be altered in different ways to become a proper Arabic name. Of course, one could do that with any fictitious name and that doesn’t prove anything. There is no historical record of anyone fitting his description. The name of the accursed book “Necronomicon” will also fail to yield any real books. It is most commonly translated from Greek to English as “The Book of Dead Names” but Lovecraft himself wrote that it should be translated as "an image of the law of the dead": nekros - νεκρός ("dead"), nomos - νόμος ("law"), eikon - εικών ("image") (H. P. Lovecraft - Selected Letters V, 418). The supposed original Arabic title of the book is “Kitab Al-Azif”. I am unable to find any entry in any English-Arabic dictionaries for “Azif” or “Al-Azif”; most likely, as Lovecraft admits, it is a fictitious title. Outside of Lovecraft’s fiction, there is no reference to any of these book titles. However, I believe I have discovered the inspiration for the Arabic title. More on that below. Before we continue any further, I will briefly point out that one may find a “Necronomicon” for sale on Amazon or other sites for $7.99. This book is known as the “Simon Necronomicon” and it is nothing more than a modern day invention that was written in the 1970s and merely uses the title to gain notoriety and fool the reader into thinking that it is the same book found in Lovecraft’s Mythos. It is at best fan fiction and at worst a simple sales gimmick. Let’s continue to more worthy subjects . . . 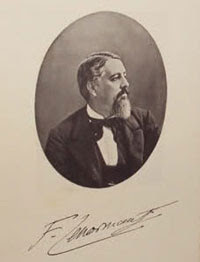 The most commonly cited book that supposedly proves the existence of the accursed book is La Magie Chez les Chaldeens by François Lenormant (1877). I’ve seen many internet postings claiming that the Necronomicon is mentioned in this book, which was written before Lovecraft’s birth. I noticed that no one ever actually cited a page or direct quotation from it. I found that this is because there is no such passage in La Magie when I read it in 2005 for the first time. While there is no reference to an evil grimoire, there is reference to evil sorcerers. Only the books of divine magic are still in existence (there’s no proof that black magic books even existed) and that “the diabolical and malevolent magic is excluded with horror, and its practices are energetically condemned.” (p. 59) It is natural that one could imagine that one of these nefarious books would be a Necronomicon, but there is simply no evidence or reference to their actual existence. 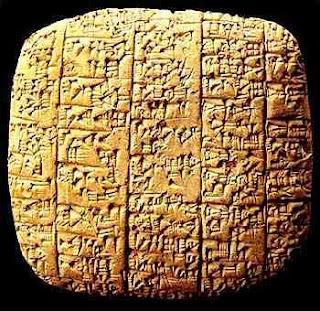 Lovecraft’s Mythos does bear a correspondence with the Babylonian and Sumerian mythology described in La Magie. Astrological symbols and gods from the deep sea are referenced in both. We find on page 157 the story of Hea, appearing in the form of Oannes--a half-man half-fish demigod who taught mankind numerous religious and social laws. There were also many other fish avatars in Chaldean mythology known as “annedoti.” Hea was one of the chief gods and was known as “the master of the abyss of waters and lord of Eridu” and was believed to be the repository of all science and knowledge. It is possible that Lovecraft read this very book as it seems he did have a knowledge of Babylo-Chaldean mythology and that his Mythos were heavily influenced by it. However, La Magie is not the only book of its kind. Between 1880 and 1900 there were quite a few books written about these ancient religions and I have no doubt that Lovecraft read many of these books and used the information and language of them to color his ideas of unimaginable cosmic entities. 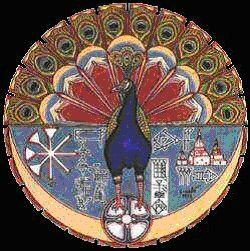 The Kitab al-jilwah (The Book of Revelation) and the Mishefa Reş (The Black Book) are the sacred books of the Yezidi--the alleged devil worshipers of northern Iraq. Certainly, their books could be real Necronomicons since the original was supposed to be an Arabic manuscript. The only problem is that they are of Kurdish ethnicity, not Arabic ethnicity. Secondly, their books contain no reference to sorcery or black magic and Yezidis do not condone this practice. They are not devil worshipers in any sense. They believe in the same God as other Abrahamic faiths with the main distinction being their belief in Melek Ta'us, the Peacock Angel. He has been identified with the Shaytan of the Qur’an, but instead of a prince of darkness, in Yezidism he is the chief angel and ruler of the Earth who refused to bow to Man. He is revered for this by the Yezidis (who believe he was actually obeying God by refusing to do so), whereas he is condemned in other faiths because of this. They believe he is the revealer of all other religions as well. It is easy for something hidden in plain sight to be overlooked. The Egyptian Book of the Dead, translated by E. A. Wallis Budge, was first printed in 1895 and would certainly have been available to Lovecraft. The rituals, gods, and monsters described in it bear a similarity to the Mythos. Ancient Egyptians undoubtedly influenced Lovecraft as they are alluded to in some of his stories, and one of his Outer Gods, Nyarlathotep, was described as a tall, swarthy man who resembled an Egyptian Pharaoh in his first appearance in the Mythos. Also, note the similarity between the names of the Book of the Dead with the English rendition of the Necronomicon--the Book of Dead Names. In fact, according to La Magie, Egyptian magic is more in line with the type of magic described in the Necronomicon than Mesopotamian. Page 94 states that knowledge of certain magical formulae could elevate man the height of the gods. These mysterious words were only given to the initiated. On page 100, it states that this is unique to Egyptian magic and is absent in other nations. The Chaldean sorcerers only commanded lesser spirits to do their will and only prayers and supplications were used to gain the favor of the gods. It seems to me that the type of magical system contained within the Necronomicon is more similar to Medieval European ceremonial magic. The Lemegeton (Clavicula Salomonis or The Lesser Key of Solomon) seems more similar to the Necronomicon than any of the Mesopotamian tablets encountered in the above books. 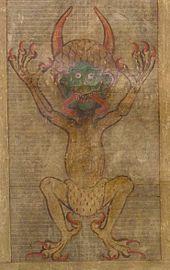 The Lemegeton is a 17th century grimoire that details all of the demons that King Solomon conversed with and how to conjure them into physical appearance and compel them to do the sorcerer’s bidding. It contains many elaborate ceremonies and is laden with different seals of these demons. Although it purports to date to King Solomon’s time, it contains numerous references to Christ and is clearly a European creation. It does contain references to older ceremonies that date to around the 14th century. There are many real books that could be real life inspirations for the Necronomicon. For instance, The Voynich Manuscript is a lavishly illustrated book from the 15th century that is written entirely in an unknown language. It is supposed that it is not a language but a code that has not been deciphered to date, but no one really knows. The illustrations range from botanical (every page contains at least one plant), astronomical, cosmological and even what are thought to be recipes. The author is, of course, unknown but Roger Bacon is rumored to have written it and sold it to John Dee. The Devil’s Bible, or Codex Gigas, is another example. It is the largest medieval manuscript in the world and weighs in at 165 pounds. It is known for its diabolical name due to a 50 cm tall illustration of a devil and, according to legend, this bible was written in one night by a monk that sold his sole to the devil. And finally we have the Book of Soyga. It is a 16th century Latin treatise on magic known to have been in the possession of John Dee. After his death in 1608, it was lost. Then one day in 1994, two manuscripts were found in the British Library and the Bodleian Library! Its contents include the standard lists of angels, magical formulae, demonology, conjuring, etc. It does cite unknown grimoires and 36 blocks of letters that Dee was unable to decipher. Dee, during a scything session with the aid of Edward Kelley, asked the Archangel Uriel about the book and was told that it was first revealed to Adam while in the Garden of Eden and that it could be interpreted by the Archangel Michael. Note that in the Lovecraftian Mythos, John Dee supposedly translated the Necronomicon into English, but it was never printed and only pieces survive. All of these books could easily have served as a basis for the Necronomicon, but it is unknown if Lovecraft even knew of the existence of any these. Undoubtedly, there are numerous more lost or mysterious books that could be listed here. The Necronomicon is most likely a conglomeration of all such books. I believe that the Necronomicon has become a symbol of all lost books of antiquity. No one can ever really know what was contained in them and they will forever be shrouded in an impenetrable veil of mystery. “Now about the ‘terrible and forbidden books’—I am forced to say that most of them are purely imaginary. There never was any Abdul Alhazred or Necronomicon, for I invented these names myself. Robert Bloch devised the idea of Ludvig Prinn and his De Vermis Mysteriis, while the Book of Eibon is an invention of Clark Ashton Smith’s. The late Robert E. Howard is responsible for Friedrich von Junzt and his Unaussprechlichen Kulten. . . . 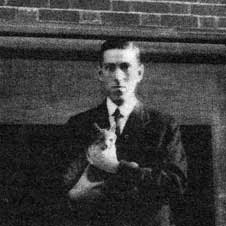 It is to Lovecraft’s credit that there is still, eighty years later, a following of adamant believers in a fictional book of his creation. The Necronomicon becomes all the books lost to history that can never be recovered and will forever be an item of mystery, even if it is only a work of fiction from the grand master of horror’s mind.